Well folks, I’m officially back in China. I was really lucky this time in that I didn’t have to travel the journey alone. 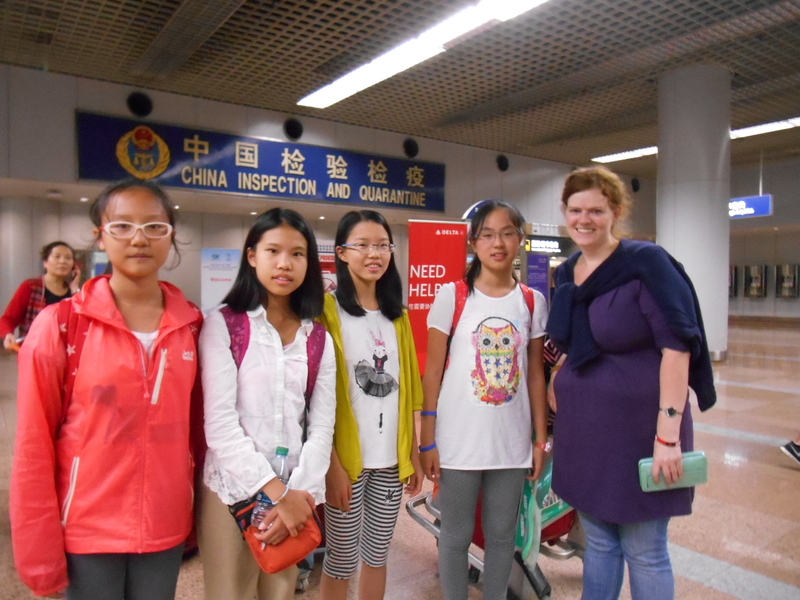 My Chinese friend Jenny and 10 of her students were in America this summer to visit Chicago and Harding Academy, and I was able to meet up with them in Chicago and travel back to Wuhan through 3 grueling layovers. I am grateful to the All-mighty that we didn’t miss any of our flights. In fact we almost did. Two of the flights we literally walked off one plane, around the corner and the next plane was already boarding passengers. Wow. I feel very blessed to have had a safe and uneventful trip. So, funny story for you. On the 12 hour plane ride to Beijing, I’m sitting next to Jenny who has an aisle seat. As the plane begins it’s assent, and the nose of the plane starts facing upwards, a sudden burst of water comes streaming down from the ceiling. I’m not talking about a slow drip here, this was probably a several cups of water, enough to thoroughly soak her pillow and blanket on the seat. In the meantime the stewardesses are already strapped into their seats and unable to move to check on us. So I’m freaking out, okay thinking “This is not normal, this plane is going down”. Come to find out the stewardess said later that all the condensation from the inside air conditioner drips down in that one spot. And she’s all like “Hey this is perfectly normal”, and I’m like “You have got to be kidding me”. So long story short, I’ve got to write an angry letter to Delta explaining what happened, but I did get the tail number of the plane, and hopefully they will check it out and fix the problem. When we got to the airport in Wuhan, there was a large greeting party of all the kids parents, and they gave Jenny a beautiful boquet of flowers. It was a pretty great experience overall, and I’m very glad that I had someone to share it with.